During its May 2012 meeting, South Texas College’s Board of Trustees elected a new board leadership team. Rose Benavidez, District 1 trustee, takes over as board chair from outgoing chair Gary Gurwitz, District 4 trustee. Roy De Leon, District 7 trustee, was elected the vice chair and Graciela Farias, District 2 trustee, was elected the secretary. Board leadership changes every two years. Members nominate fellow members for the three leadership positions and then the entire seven-member board votes with a majority rule for each position. For additional information about STC’s Board of Trustees visit http://www.southtexascollege.edu/about/board/index.html. 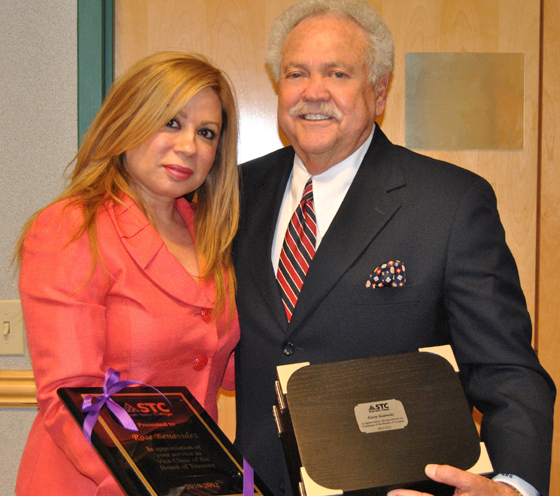 Rose Benavidez and Gary Gurwitz receive plaques from the college for their service as STC Board of Trustees vice-chair and chair, respectively.